This is the last day to enter the Père Music Giveaway! So hurry and enter to win a $900 package! We have an absolutely amazing giveaway that we are offering you today! It's from Père Music. And it's worth $900! You are going to love this concept! I know that I did! This is a perfect and unique keepsake to give to your baby or as a gift to another! 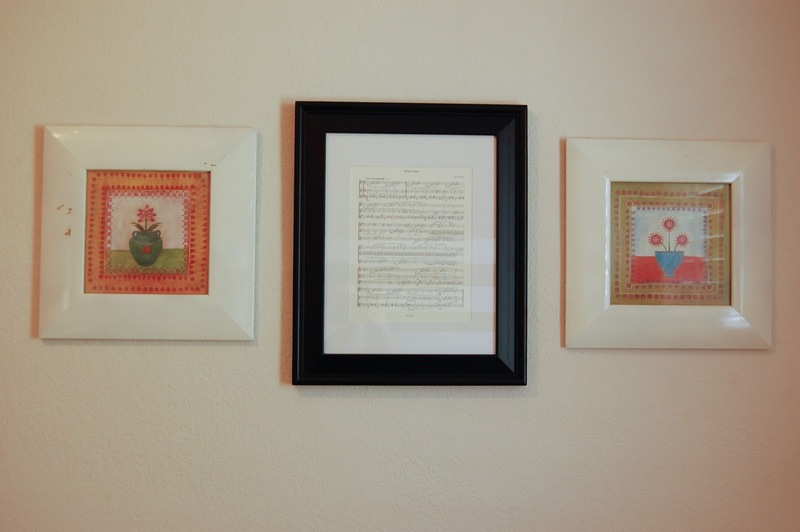 We create classical music inspired by your baby. 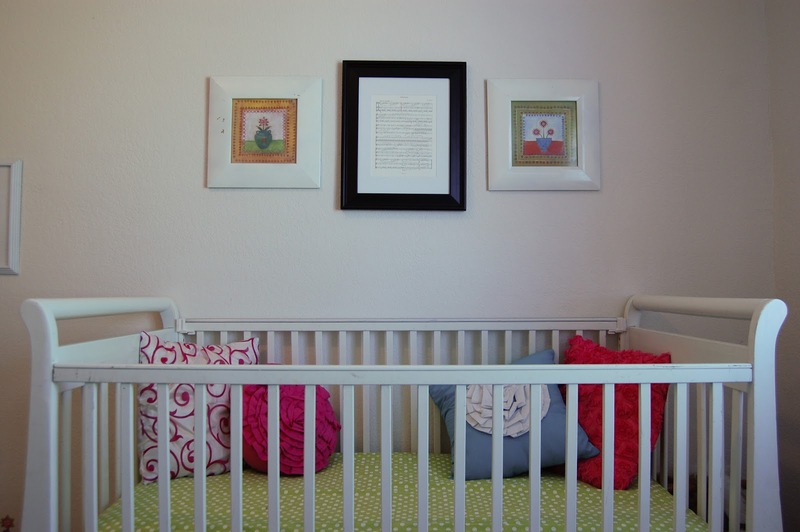 Send us photos and videos, or just tell us about your little one's personality. After just a few days, Ken will create a piece of music for violin, inspired by your little one. We’ll let you take a listen - tell us if you have a few tweaks you’d like to hear or if you love it the way it is. Once you’re happy with the sketch, Ken will finish up the rest of music. You'll take one last listen to the completed song (to make sure you really love it) before we create a high quality recording. 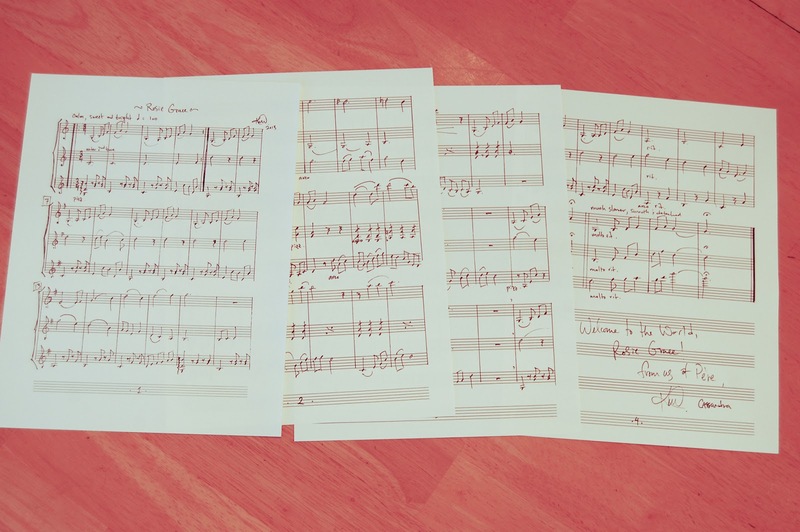 Afterwards, we'll send you a link to your song and send you the music (framed and ready to hang) as well as Ken's original handwritten score to keep. Isn't this just absolutely amazing? 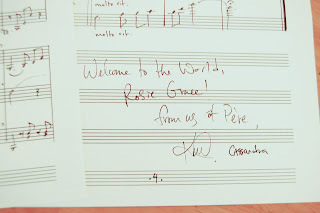 I was so excited to hear about Père Music. I love music! I grew up playing piano and violin. And now I have all five of my boys are in piano lessons, two of them take violin lessons, one is in cello lessons and one in viola lessons. So this is all near and dear to my heart. And I love that they create a song especially written for your baby. It is simply beautiful and delicate, just like Rosie! And here is the sheet music. I'm really looking forward to my boys playing this for Rosie during the summer months! We are two longtime friends and artists who recently found ourselves surrounded by the adorable babies of friends and family. 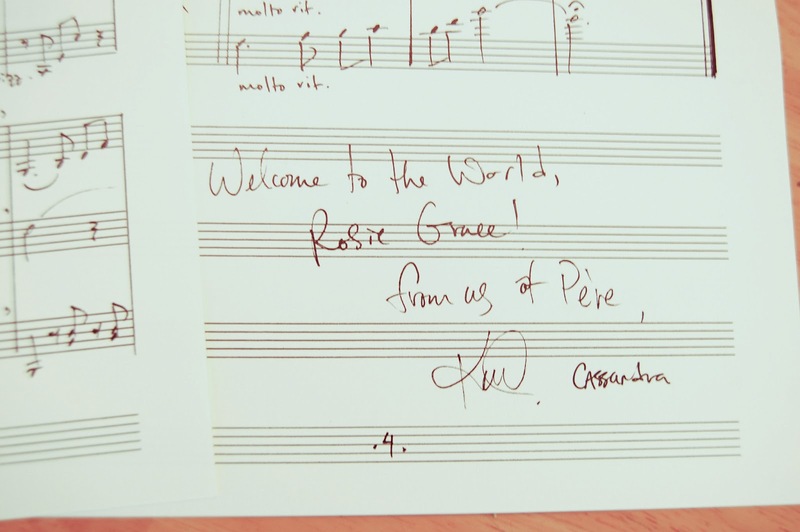 We started Père Music to capture the personality of newborns through classical music. 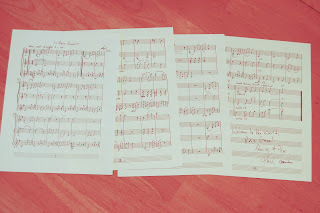 Père composes etudes for violin using descriptions, photos and videos provided by parents. Ken is a classically-trained violinist and pianist, but enjoys working in many different genres - most recently, baby music. With nearly 20 years of music writing under his belt, Ken has a knack for storytelling through music. Check out his website here. Cassandra is a visual artist with over 10 years of marketing and advertising experience. She’ll be your point of contact as producer and partner at Père. Aren't Ken and Cassandra amazingly talented? I love the way the music looks in Rosie's room! You are not going to want to miss out on this! So hurry and enter! Hey Everyone! We are going to extend to Sponsor Ad Giveaway and will announce the winner next week! The winner will receive the HUGE Sponsor Package! Come by and enter HERE! 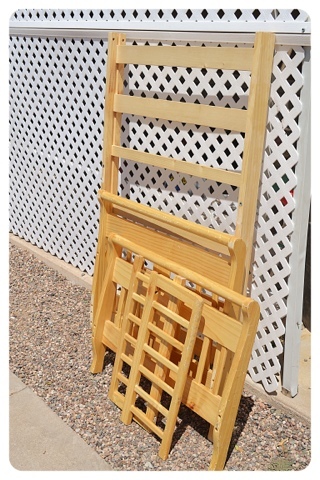 We recently moved from Amarillo, TX to Mesa, AZ. During our move my daughters bed got destroyed! 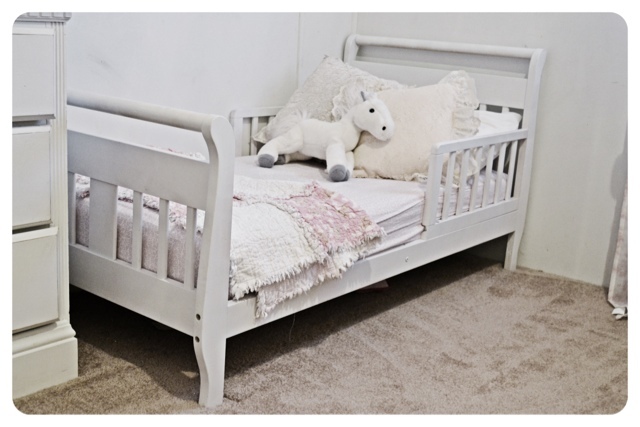 When I found this toddler bed at a yard sale I knew I had to redo it for my daughter. 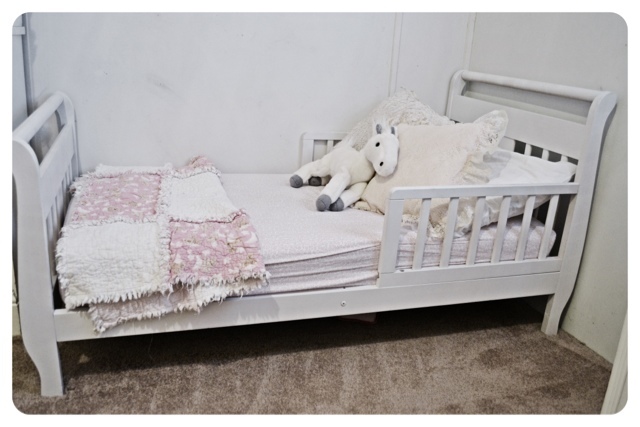 This is the bed in my daughters room now! It definitely fits her Shabby Chic room! Pretty dinged up, but for $5 I couldn't resist. We were actually lucky it made it home in one piece, because it blew out of my truck driving down the road!! To redo the bed, I used Krylon Paint & Primer Spray Paint. I roughly sanded the bed down and then went to town with the spray paint. This bed actually used 3 cans of spray paint. It was SUPER easy and definitely worth the $5! Years ago, we found this table on the side of the road. I was so excited! I couldn't believe that my neighbor didn't want it any more! So I quickly enlisted my boys to walk down to her house and pick up the table and drag it to our house. I knew that I could use it for something. For a while, this table served me well as my craft/sewing table. I always had the intention of painting it and making it look cute, but I just never took the time to do it. It needed a bit of work before I could paint it. It was pretty wobbly. I finally finished the table! My husband made the table sturdy, my boys sanded it down and helped me paint it and then I glazed it and...I love it! I can't believe that it took me so long to finish! One of the reasons it did take me so long was that I remained indecisive on what paint color to use. I debated over white and black, then turquoise. But when all was said and done, I decided to use Valspar's Bungalow Gold. Since we are renting right now and all our walls are white, I wanted to do a splash of color to decorate around. And this was the perfect choice! After the sanding and painting, I decided to glaze it. I tinted the glaze with ebony stain. I painted it on and then wiped it off. I really liked all the imperfections of the wood, so I left as much glaze as I could in all the knicks and scratches and grooves of the wood. It turned out amazing and is now the new home of my computer! He would rather have an extra helping of mashed potatoes and gravy, over pie and ice cream. I have been pondering on a special treat to make him. I was Really, Really surprised how yummy my creation turned out. So I wanted to share it with everyone. This recipe you will not want to pass up!! First, start out with Briana's Good Ol' White Bread Recipe. While the dough in kneading, saute' 1/2 finely chopped onion in 1 TBS of butter until it turns clear. Once the dough is done mixing, divide it in half and roll it out just like you would when you make cinnamon rolls. About 24" x 12" x 1/2" thick. Spread 1 small can of chopped green chilies, 3/4 c. shredded cheddar or colby-jack cheese, 1/4 c. bacon crumbles, and the saute' onions evenly around the rolled dough. Now gently roll it up, slice the rolls about every 3 inches, and place in a lightly greased 9 x 13 pan. Bake in a pre-heated oven at 350 degrees for 20-25 min. With the other half of the dough you can either make a loaf of bread, or roll into balls and make dinner rolls, or make a batch of cinnamon rolls. I recently joined Birchbox! 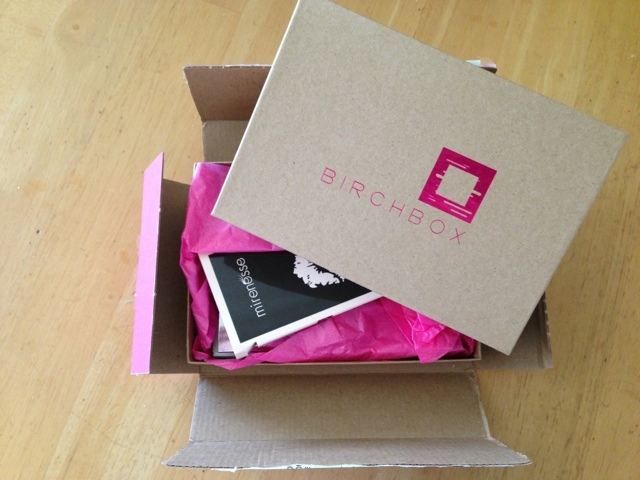 I have heard of Birchbox before and put it on my list of things to do or sign up for later. Now that I have signed up, and received a couple boxes in the mail, I'm sad that I put it off until later. Birchbox is a great way to discover new beauty and lifestyle products. You can subscribe to the monthly box for $10 per month and that includes shipping! And then every month, they will send you a box full of samples and even an occasional full-size product to try out. Then you can earn points buy purchasing products and referring friends to get more products for free! So this last Birchbox that I received had two full size products: a lip crayon and under eye rollerball! And the samples are so much fun as well! There was cologne, face cleanser, hair product and more! 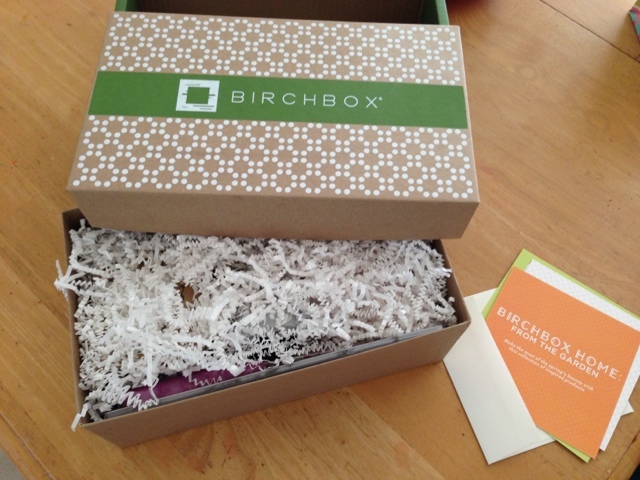 You should definitely consider giving Birchbox a try! You will love it! I also bought the Special Edition Garden Birchbox! Occasionally, they offer Special Edition boxes that you can order separate from the monthly subscription. The Garden one was so fun with seeds, lotion, a cutting knife (for all the fruits and veggies from your garden), a notepad, cologne, a candle and more. And the packaging is so cute! It's like getting a fun gift from a friend! I love it! So what are you waiting for? Don't regret waiting to order, like I did. Try it now and see just how fun it is! I always wondered if paying for a XL ink cartridge would be worth the money. A regular HP 60 cartridge is around $19 and a HP 60 XL is about $34. I took a small labeling sticker and dated it when I put the new cartridge in. Then when I was out of ink I dated it again. Almost every time the regular cartridges lasted one month exactly while the XL had about a 3 month duration. So is it worth the money? Disclaimer: Now all printer ink cost differently at different stores, and everyone uses their printer at different frequencies than others. So give it a try and see if the XL cartridges are worth your money. We are excited to announce a winner to our Fluffy, Funny and Fabulous!!! Drum Roll.... And the winner is... #105- Tiffany Lauren Hutto Congratulations Tiffany!!! I have sent you an email. You will need to respond to the email within 24 hours or we will pick a new winner! Thank you to everyone who entered! 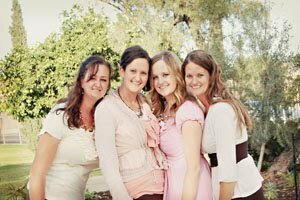 If you didn't win, you can always click on over to The Five Sisters Website and order a book! And we have some really exciting giveaways coming up, so stay tuned! !